My kids are the inspiration for this book. As a mother of triplets, I know first hand the joys, the laughter, the tears and challenges of raising multiples. This is a book about siblings and relationships. I wanted to explain to young readers, 2-6yrs old the concept of what it means to be a multiple, to be born at the same time yet to be so different. The colourful illustrations and easy wording makes it a wonderful book for young children to enjoy and read. Three Times the Fun is a picture book for preschool children written by Michaela Lincoln and illustrated by Noah Adam Paperman. What’s it like being triplets? It’s undoubtedly a lot of work for Mom and Dad, but having two siblings the same age can be a lot of fun as you’re growing up. The triplets in this story are fraternal, as opposed to identical triplets. They look different and have different eye or hair colors. One triplet is a girl while the other two are boys. Lincoln’s story is based on her own experiences as a mom to three wonderful triplets who are now adults. She shares the chaos of diaper changing and bottle feeding three infants at a time as well as the joys of seeing her kids grow up with their own fraternal support system. 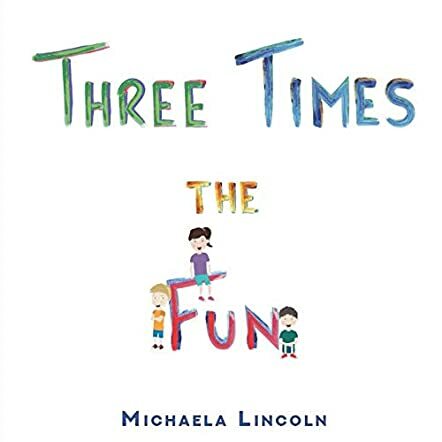 Michaela Lincoln’s picture book for preschool children, Three Times the Fun, is a grand resource for families with triplets or twins, but it’s also useful for getting kids to understand that the twins or triplets they might go to school with are different people, even if they are identical in appearance. Paperman’s colorful and lighthearted illustrations go a long way to showing how Lincoln’s three triplets interact and are there for each other. This is a grand selection for story time, but it’s also written in language that makes it equally suitable for young children to read on their own. Three Times the Fun is highly recommended.